First Marcus Carey and Jennifer Jin released the @tribeofhackers book and inspired me to get back to researching to make my digital book a physical reality in 2019. This is an excellent response, but for some, it is the beginning of a longer conversation that some are not prepared to have. 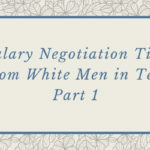 I have been in the unfortunate position of having that response and being unprepared for follow-up questions, so I wanted to use research to help others navigate some of the dialogue that happens during negotiations. I considered reaching out to successful women to answer the questions, and I still may. 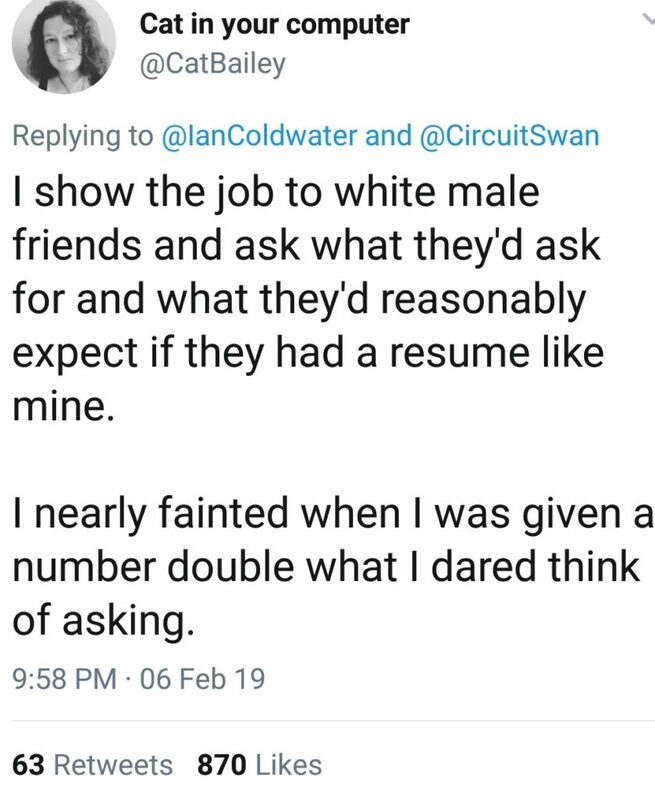 But I decided to ask white men in tech because they continue to make more money than every demographic in America regardless of skills, education, and experience. We cannot move forward without a number. What is the minimum base salary you will accept? Any other advice you would like to share? I’d originally planned to compile all my research before publishing, but that could take weeks (months?). I was so moved by this respondent’s transparency that had to publish it. He shared tips and tea! 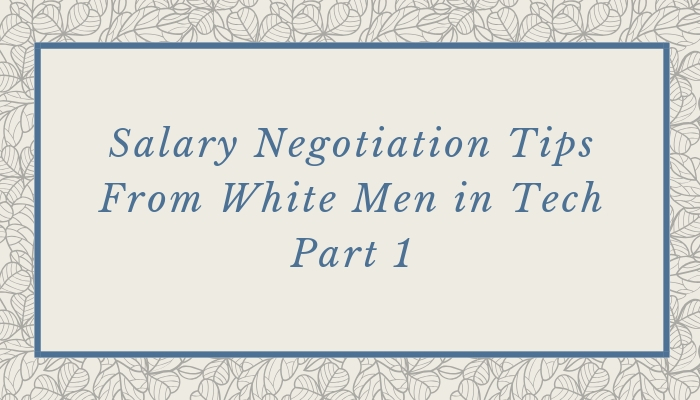 Even though a lot of this will spark “well of course he’s able to negotiate like this, he’s a white man!” reactions, I encourage you to read it with the intent to be empowered. I have lots of thoughts that I’ll share at a later date, and look forward to hearing your feedback. Question 1: What are your salary expectations? After publishing this post, I was notified that @CatBailey sent the tweet above last week. I was not aware because I do not follow her, but I updated the post to illustrate a point. If you can, find a trusted person within the org to help you set expectations. Glassdoor never ever reflects exceptional talent compensation, Blind tends to be a better reflection if you can’t get direct info. Remember that large company salary budgets can be solidly 2-5x what you were making at a small company. Ask someone in a comparable level at a different company if you have to. Find a senior dude you trust, and just flat out ask him how much he makes. More of them will be willing to tell you than you might expect. Don’t ask what he thinks you should make, ask him what he makes. Remember that for large companies, the “rules” around salary and comp are often MUCH looser for groups or divisions that are pioneering new tech, pushing the boundaries, or dragging the company into the 21st century. That’s where you want to work anyway. It’s also worth reminding readers that if the cash salary is big enough to get by, total comp is the number you care about. 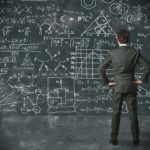 In a great many cases total comp is way way more flexible than base salary – for large corps, base cash salary is often strictly banded, but RSUs or options are significantly flexible. I’ve personally negotiated a doubling of the initial stock grant offer for a position where stock was more than half my comp, your counterparty often has this flexibility. Speaking of numbers, your new employer doesn’t have a solid understanding of your current comp. In California it’s illegal to use that info, in other states the reported number to the agencies is often only base comp, not total including stock and bonuses. Flat out lie about your current comp, it’s a valid negotiating tactic. Do it. It gives your adversary a comfortable way out to say “of course, that wasn’t the whole package” without embarrassing them for making a lowball offer. Practice that conversation with a role playing partner before you have it. For positions with more than 4 years of experience, at public companies you should expect stock grants to be a significant part of your compensation. In my experience, if your total comp is 100-200k, you should negotiate at least a quarter of your cash as stock, if you’re over 350k, you can expect around half. If you have 8+ years of technical experience and your RSU stock is 10% of your comp at a large public company, you’re getting ripped off. Don’t let them do this to you. (This advice doesn’t apply to weird cases like Netflix, where policy says you’re paid top of market and comp is entirely in cash. But that’s probably the only place it’s true). If you’re working at a startup, value your options at $0 and count it as a windfall if you get lucky. If you’re comparing startup to Corp comp, get the cap tables and figure out how much the startup would have to sell for to equal your 4 year vest at the public company. In my experience, startups are fabulous life experience, but basically never will make you wealthy unless you’re earlier than employee 10 or 15. The last offer comparison I made, the startup would have had to sell for 10 billion dollars (seriously) and issue no more stock just to equal the guaranteed comp offer from a large corp over 4 years. Needless to say, it didn’t sell for that. Editor’s Notes: I love this community! Adrian Sanabria @sawaba developed a Salary Comparison Worksheet for #BsidesLV #HireGround. He invites everyone to test, copy and bug test it. Click here to access it. A few people also mentioned that Levels.fyi has better salary data than other online salary guides. Click here to learn more. Question 2: What is the salary range you’re after? If you’re truly blind and don’t know what the position is worth, ask for at least 40% more than you’re making now. Worst case they counter with whatever they were thinking of paying, and you then negotiate 10-20% over that number. I’ve had mentees who ended up getting 120% raises by just asking for big numbers. I repeat, once they’re seriously having this conversation, they’ve decided to hire you. They’ve already invested a bunch of time in finding you, a bunch of valuable people’s time interviewing you – you won’t offend them into rescinding the offer, and if that does happen, OMG RUN AWAY THE WARNING SIGNS ARE TOO BIG FOR THIS MARGIN. Your future coworkers will be mad at their boss for not hiring that person they gave the thumbs up to. The hiring manager wants you, take advantage of this. Question 3: We cannot move forward without a number. What is the minimum base salary you will accept? The best advice I’ve heard about this is “let’s put down $1 and we’ll revisit that when it’s relevant”. Alternatively, sub a million bucks, or half a million (but seriously, don’t limit yourself to that). Remember that in basically every case the salary negotiation doesn’t really begin until after they’ve decided they want to hire you. Remember salary and total comp aren’t the same thing, if you do cave and let HR badger you into a lowball number, ask for lots more in stock. Remember that how much money you ask for is always a direct reflection of what career level they hire you at. Don’t want to be an IC2? Ask for an IC4 comp. This is the most consistent way tech companies keep disadvantaged folks salaries down – start them under level and only eventually promote to where they should have been hired at in the first place. 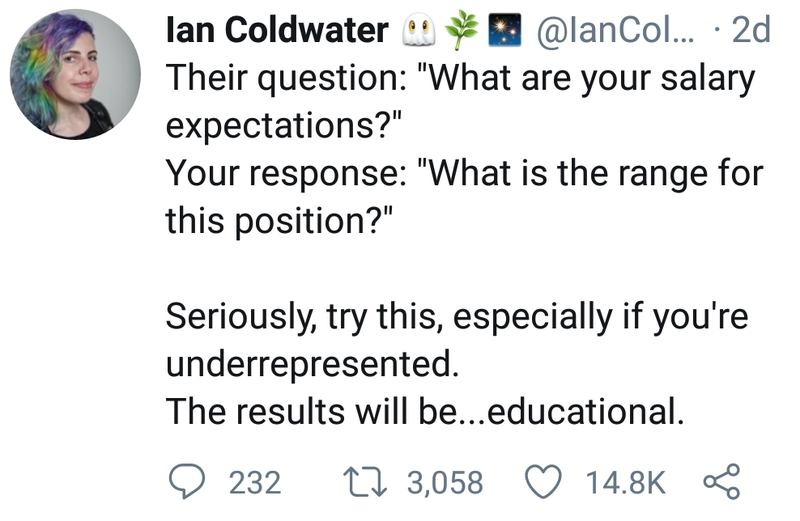 This can be a particularly good reason to start early comp numbers at a higher benchmark, because you’ll be interviewed for the higher level position. Make sure you know who you’re taking to. HR will try to wheedle a number of off you, and then limit you to the that value administratively. One large tech company has a hard policy of only 10% over previous salary. Don’t fall for that. Don’t negotiate salary with anyone other than your future boss or their boss. Never give HR a real number, it may tie your bosses hands. Never negotiate numbers before you’ve been fully interviewed and you know they want to hire you. In the past, I’ve named numbers significantly higher than I knew they were going to accept, and had the other party flat out tell me what their expected range for the position was in response. In California they’re obligated to tell you the range for the position, but the law is relatively toothless because that’s not including stock and contractual bonuses. Remember that for even lower level technical positions, the total acquisition cost is often 10-20 grand per person that actually gets hired. Harder to fill positions can pay up to half your first year’s salary to the recruiter who brings you in. Once they want you, you have the upper hand. Hiring good people is hard, take advantage of that. Casually ask the manager how long they’ve been looking to fill the role. Question 4: Any other advice you want to share? When working for tech companies, your comp is your responsibility. Do not fall into the trap of thinking that virtue, hard work, and team play will be naturally rewarded. The opposite is true. You should interview for new positions at least once or twice a year, even if you aren’t considering moving. The practice is good, and you might find something fabulous and way better. It’s never disloyal or wrong to your current company to look around. You will never get a huge raise at your current company, even if you get promoted. Your path to reasonable salary is to kite between the large companies. Every time you change jobs, you absolutely positively need to land at least 20% higher than your previous max comp. You should start seriously looking for your next opportunity around or a bit before 3 years into your current job. This means that you’ve earned most of your initial stock grant, and you can use that number as your starting point for the next job. This avoids a salary cliff, and any chance of seeing total comp regress. If you don’t have any luck, you’ve got a year to fall back, earn the same salary and try again. Never stick around after a significant comp decrease. Never ever accept a standalone first offer. I know it’s tempting, I know interviewing for jobs is exhausting, but don’t settle for your first offer. You have leverage when negotiating the second offer from a different company, because the dollar value needs to be better than the first. Be blunt, be clear “I have another offer for $X from company Z”. Say “I really like your company, but I need to finish the process with with company Y before I accept your offer.” This very often results in an increased offer from the first company, before you even get a competing offer. This is true even if you aren’t actually interviewing with company Y, or don’t yet have an offer from company X. This bargaining tactic is especially effective if the alternate company in question is known for paying outsized salaries (use Netflix, it’s always a good bargaining chip). Your first offer wants to seal the deal before you have a second offer to negotiate with. Don’t be ashamed of leveraging companies against each other, it’s just business. Ignore short offer expiry dates, especially if you’re getting a competing offer. Tell the hiring manager you’re going to let the date go by because you want to finish the interview process somewhere else. This often results in increased offers, and given how much they’ve already invested in finding you, almost never results in a take back of the offer. The above strategy works for getting raises too. “I really love my team, and feel that I contribute incredible value here, and I want to stay, but I got this 20% raise competing offer” is often the key bargaining chip your boss needs to go to HR and get you a real raise. They will ask for proof of the offer, feel free to show it to them in person, but don’t feel obligated to give them a copy to give to HR, they don’t need that. Your boss often is constrained by corporate policy about raises, but can break that policy in the event of a competing offer to save a key team member. Don’t be distracted by future vesting total dollars. The only number that matters is current annual vested comp. That’s the number you compare for your next job. Never take a job with Amazon. The stock issuance plan is exploitive in that it’s loaded towards the rear of your 4 years, and it encourages managers to fire people just before they vest. Learn the difference between options and RSUs. For established public companies, options are almost always a fools bet, take the RSUs if they’re offered, they’re as good as cash. When they vest, sell them and diversify, don’t try to time the market. Pay into your retirement plan. I know it feels like money you can’t afford right now, but that will be true for the next 10 years. Learn from my mistake, get started early. This all sounds overly aggressive and maybe a bit cocky, but all of this comes from real experience, and much of it has helped coach folks into way better positions. Finally, if you’re considering quitting and you ask for a raise, your boss will ask you if anyone else is unhappy too. 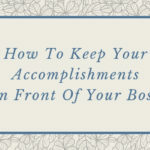 Consider advocating for underappreciated colleague – just give them a heads up so they can get their story straight. That was how a friend got me my first real raise. Writer is a Senior Security Engineer at a large tech company in California. I’ve benefited from the system, I want to use my privilege to help pull others up alongside me. If you are a white man in tech/InfoSec and would like to participate in this Salary Negotiations research study, feel free to copy/paste the questions below with your answers in this Contact Me form and submit! What is the salary range you’re after? Pay equity benefits everyone, including you when you want to fire your awful boss or face health issues and bae has to keep the family afloat. Just like the author above, the only identifying info will be title, sector, and state. Keirsten Brager is a Lead Security Engineer at a Fortune 500 power utility company, @tribeofhackers contributor, and was one of Dark Reading’s 2018 top women in security quietly changing the game. 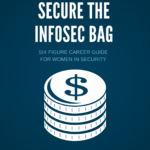 She is also the author Secure The InfoSec Bag: Six Figure Career Guide for Women in Security. 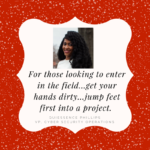 She produced this digital book to help women strategically plan their careers, diversify their incomes, and fire bad bosses. 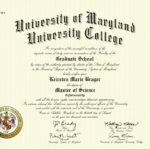 Keirsten holds a M.S. 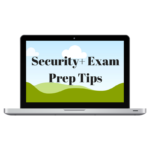 in Cybersecurity and several industry certifications, including Splunk, CISSP and CASP. As an active member of the Houston security community, Mrs. Brager has participated in a number of panels and public speaking engagements promoting strategies for success. In her free time, she loves blogging, cheering for her beloved Saints team, and convincing women not to quit the industry.